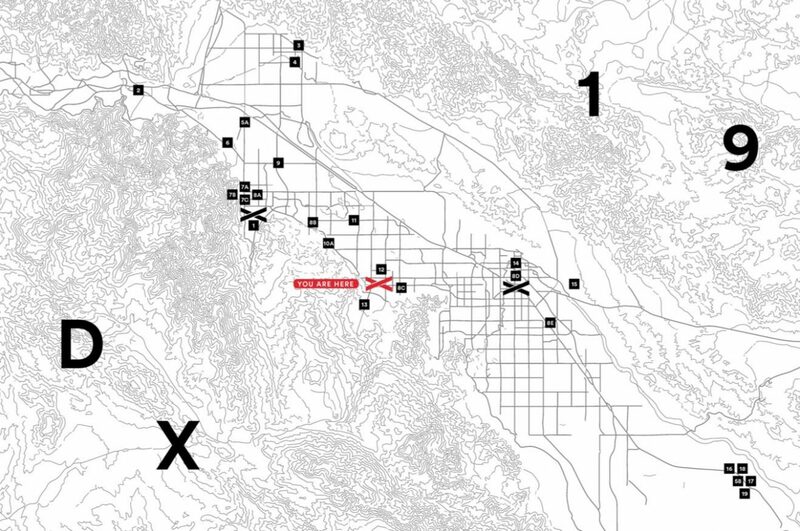 Desert X, the renowned biennale set in the stunning environment of the Coachella Valley desert, invites 20 international artists to reinterpret the surrounding landscape through their work. The environment is key here, with all works site-specific. Produced by Desert Biennial, a not-for-profit charitable organisation, the works all intend to address and highlight urgent social, political and economic issues. Artists such as Iván Argote, Armando Lerma, Sterling Ruby, Eric N. Mack, Pia Camil, Kathleen Ryan, Gary Simmons, Julian Hoeber, Iran Issa, Mary Kelly and collectives Superflex and PostCommodity, present works in various parts of the Valley, indoors or outdoors. A comprehensive map of the area pinpoints where artworks exactly reside for those exploring the biennale. 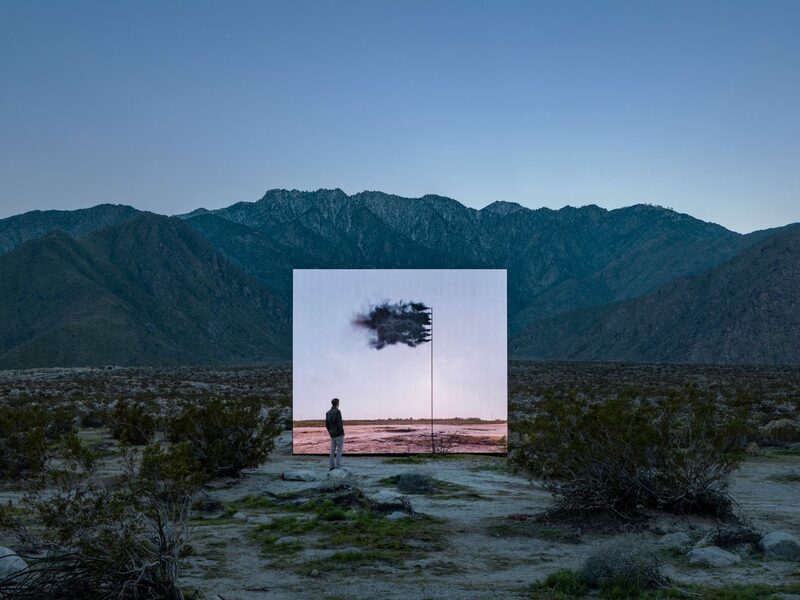 John Gerrard reminds us of the impact of exploitation of natural resources in his video work Western Flag screened with the Valley landscape as a backdrop. The new photographic series by Cara Romero titled Jackrabbit, Cottontail & Spirits of the Desert presents time-travelling visitors from the Chemehuevi tribe exploring their sister tribes’ (Cahuilla, Serrano and Mojave) ancestral lands again, reminding us of the deep connection we all posses to nature and the earth. Sterling Ruby‘s SPECTER, a giant fluorescent orange monolith, highlights the Valley by emphasising the striking contrast between his work and the desert. The abrasive orange is often seen as an alarm, with the work here evoking care for the harsh yet fragile landscape. Superflex‘s DIVE IN also warns us but in a different way, reminding us that global warming will drastically reshape the habitat of our planet and reminiscing that the Coachella Valley desert was once submerged under water and this may re-occur once again in the future. With works site-specific it is both a strength and a weakness, each artwork is exposed vulnerably to the elements. 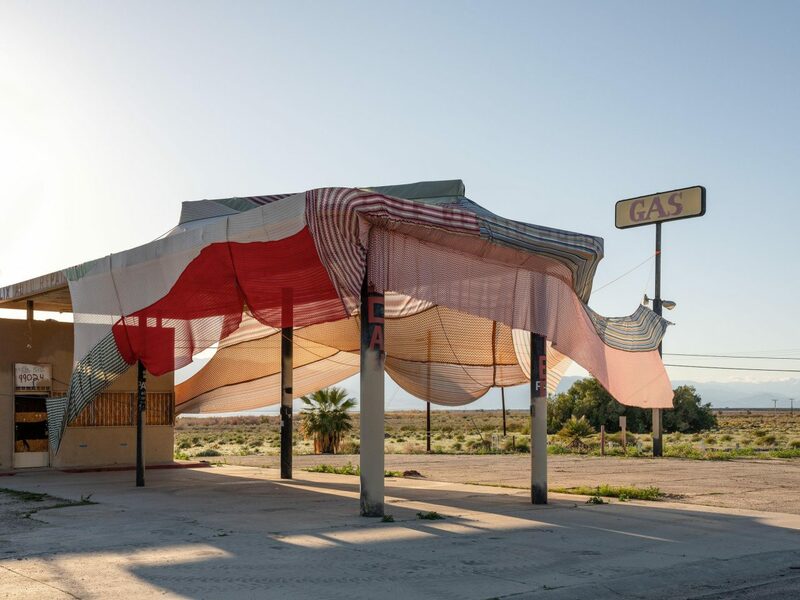 Artist Eric N. Mack‘s Halter presented in a disused gas station saw the work at the mercy of the exposed environment, with the fabrics used in the piece (donated by Missoni) vanishing into the desert landscape. (Note: with the work now closed, some have suggested it may have also been the force of a human hand). All artworks are intended to evolve, and because of the nature of the biennale, artists submit to nature’s way in the desert as soon as they sign up. Nature continues to wonder us with its fragility and force, and indeed the star of the show may be infact the Coachella Valley itself, a masterpiece which continues to endure and prevail over time. Desert X 2019 runs until April 21, with the next biennale in 2021.